Unlock our knowledge about alternative energy and renewable technologies - now! It is scandalous that much of our collective knowledge about alternative energy and renewable technologies is kept locked behind an Elsevier paywall! This is one area where clearly everyone anywhere on the planet with the inclination to read about the possibilities and push for solutions, whether through developing more basic knowledge or transferring knowledge to the business sector, should have immediate, barrier-free access. This is one area where the need is too great to permit for ANY embargo period. Science works in step-wise fashion, like a detective mystery. One scientist discovers a clue; another builds on the discovery, until we have a new body of knowledge or real-world implementations, or both. If a useful discovery sequence takes six steps, with about 6 months of research for each step, then with no embargoes, the process takes 3 years. With a one-year embargo at each step, the whole sequence takes 9 years (3 years for research, 6 years for embargoes). Consider the impact of 6 more years of increasing greenhouse gases on climate change, and it is easy to see why the public good of rapid advancement in this area far outweighs an outmoded, print-based business model. If funders are considering different embargoes for different fields, let's argue for immediate open access in this one - and let's call on the editors and authors of these journals to revolt and move to an open access publisher and model. Total impact is a set of alternative metrics for scholarship. Total impact looks at a number of factors, including social networking tools such as Facebook and Twitter. As a research tool, Total Impact has a lot of potential, to explore how works are used and what impact they have. As an alternative metric to evaluate the quality of scholarship - an alternative to impact factor - there are a number of potential serious problems to consider. First, there is the question of whether the current push towards quantitative metrics makes any sense at all. I have talked about the problems of this kind of instrumental rationality is my book chapter, The implications of usage statistics as an economic factor in scholarly communication https://circle.ubc.ca/handle/2429/954 (In brief, usage stats are likely to have significant negative impacts, from discouraging use to discouraging important but not necessarily popular entire fields of research); and the second chapter of my draft thesis http://pages.cmns.sfu.ca/heather-morrison/chapter-two-scholarly-communication-in-crisis/ (search for irrational rationalization). One example, from an interview study of scholarly monograph publishers I did recently, is the impact of pushing scholars to publish more books to obtain tenure. This pressure is not consistent with the time it takes to write books that are really worth publishing and reading; so in this instance, we have a quantitative metric intended to improve quality and productivity (of our academic staff) which appears to be lowering quality (more mediocre books, more book production when the problem for all of us is not enough reading material, but rather not enough time to read). Research, both quantitative and qualitative, is my recommendation before putting too much stock in Total Impact or other alternative metrics as a replacement for Impact Factor in evaluating the quality of scholarship. Note that I do not recommend retaining Impact Factor, but rather minimizing or eliminating quantitative approaches to evaluating the quality of scholarship. In addition, I would suggest that metrics based on social networking tools could easily be manipulated, not only by authors but also by interested others. It doesn't take much to imagine corporate polluters in favor of climate denial upping the impact of their preferred pseudo-science, or for drug companies to drive up the impact of studies making the drugs that they sell look good. Another area to consider (for all kinds of tools, not just social networking tools), is the impact of funding considerations. If universities are relying more on corporate funders at a time in society such as today when the political will seems to be on the side of the wealthy who wish to cut spending on social justice, it is reasonable to hypothesize that there will be a smaller proportion of funding for social justice issues. What happens to research on poverty issues and its impact if there is less funding for research and academic positions in this area (hence fewer researchers), at the same time that there is less funding for government services and social workers (fewer potential readers and tweeters), and many of those poverty research is meant to help have lost their homes and jobs and may find it difficult to get internet access? This week British Columbia is mourning the passing of notable citizen and philanthropist Irving K. Barber. This post celebrates a small part of the achievements made possible by his generosity, the Small Business Accelerator program of the Irving K. Barber Learning Centre. The Small Business Accelerator program is a highly innovative program and partnership of the University of British Columbia with BC's public and other libraries and the BC business community. Business success depends on obtaining access to reliable information. The Small Business Accelerator is curated by business librarians and is your gateway to freely available business information, education, and assistance that is both current and trustworthy. It is my hope that this small token of appreciation will encourage others to consider this model of cooperation, which is also a great model to illustrate how libraries and the business community can work together cooperatively, making use of open access resources, to benefit business and local communities (by making business accelerator programs available throughout the province. [Disclosure: the Irving K. Barber Learning Centre is a key partner of the BC Electronic Library Network where I serve as Coordinator]. This post highlights a few bits of data suggesting the impact of selected funding agencies' open access mandate policies. We're definitely making some progress! By my method of calculation, compliance with the NIH Public Access Policy stands at 73%. On the other hand, there is still room for improvement - for example, how is it possible that more than a quarter of NIH funded authors have yet to comply with a requirement of their research grants? SURF has just posted a report showing that open access provision rates in the Netherlands are stagnating. This chart suggests that the N.I.H. Public Access policy may be having a transformative effect beyond the works that authors actually are required to make publicly accessible. Since the N.I.H. policy came into effect, the number of journals voluntarily making all of their articles freely available immediately has nearly tripled, from 321 in March 2008 to 897 today. 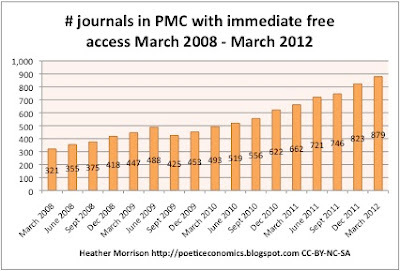 In the first quarter of 2012, the number of journals actively participating in PMC grew by 58; 56 more journals began making their articles freely available immediately; and 44 more journals made all articles open access. 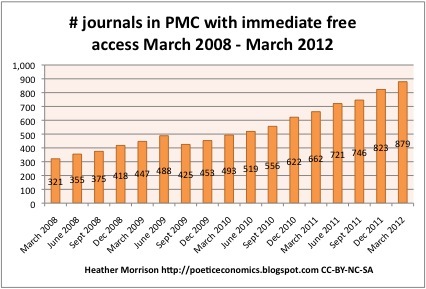 This chart shows the difference in availability of free full-text for PubMed articles within 6 months of publication, by funding support. There is no difference between N.I.H. 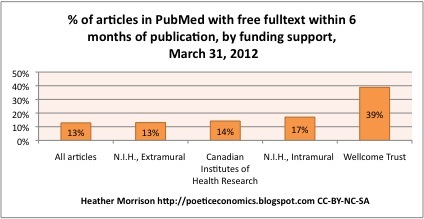 Extramural researchers and all articles in PubMed; in both cases, 13% of items in PubMed lead to free full-text. CIHR funded researchers are only 1% better, in spite of the CIHR Policy on Access to Research Outputs requiring open access within 6 months of publication. Even N.I.H. 's own intramural researchers have a record of fast free access that is only slightly higher than the overall rate. Only the Wellcome Trust has a noticeably higher track record, with 39% of works connecting with free full text. Since CIHR and Wellcome Trust have policies with the same permitted embargo (6 months), the threefold difference in results likely comes from a source other than the policy per se, such as the assertive implementation of the policy Wellcome Trust is known for. Noteworthy this quarter: the beginning of 2012 has definitely been dramatic, with the Research Works Act proposed in the U.S. and subsequently dropped, a remarkable turnaround. This came after Elsevier dropped its support for RWA, thanks to the still growing Elsevier boycott, with over 8,900 signatories. This pushback was likely inspired by the highly successful protests against SOPA and PIPA, particularly the January 18, 2012 Internet Blackout. Peter Suber wrote about RWA and the recently re-introduced Federal Research Public Access Act (FRPAA) in the March 2012 SPARC Open Access Newsletter. The Research Councils UK, an early leader in open access policy, is moving to the next level with a consultation underway on their draft new open access policy - my comments can be found here. DOAJ: 7,607 journals. Up by 235 this quarter, a growth rate of 2.6 titles per day (a lower growth rate than the average for the past year of 4 titles per day). Electronic Journals Library: 33,984 free journals, an increase of 1,600 this quarter (growth rate 18 titles per day). DOAJ searchable articles increased by 62,831. Highwire added 17,226 free articles, about 17% of the total of 97,017 articles added by Highwire in total. OpenDOAR added 22 repositories, for a total of 2,186. The Registry of Open Access Repositories added 124 repositories, for a total of 2,734. A Bielefeld Academic Search Engine (BASE) search encompassed close to 7 hundred thousand more documents, for a total of over 34 million documents. arXiv added 20,000 documents for a total of 745,000. RePEC has changed their statistics approach this quarter; to obtain numbers, I had to go to the LogEC site, download (messy) and calculate a total of 31,466 downloadable fulltext, for a total of over a million. The Social Sciences Research Network (SSRN) added over 16,000 papers, for a total of close to 400,000 papers. The number of Open Journal Systems installations hit 11,500 sometime last December. The Internet Archive now makes freely available more than 600,000 moving images, 100,000 concerts, 1.2 million audio recordings, and 3.3 million texts. This post is part of the Dramatic Growth of Open Access series.To download the data see google docs for the current full data version and the current show growth version. The Dramatic Growth of Open Access dataverse is the place to look for archived data versions. Housekeeping: if anyone would like to use the charts from this post, I recommend getting in touch with me - for technical not permissions reasons.